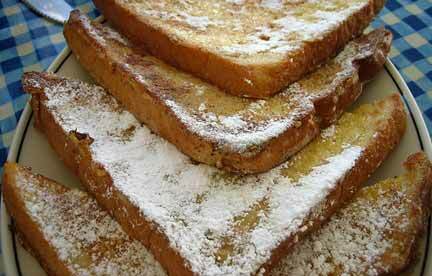 Classic french toast with powdered sugar sprinkled on the top. This french toast recipe was offered to me by a client who also happens to be a well known chef. To qualify as a low calorie food and one healthy breakfast recipe, top french toast with 1/2 cup warm fruit (recipe below), add 2 slices of lean canadian-style bacon for a breakfast under 400 calories. My chef friend says this is a classic french toast recipe. He suggests using a bread that can absorb the egg mixture, not too dense, but also be sturdy enough to hold up. Cook on a griddle or in the oven. This is a favorite of my husbands -- I make it frequently. HEALTHY BREAKFAST RECIPE TIP: Add canadian-style bacon or slice of grilled ham for a super charged breakfast to keep you going into the afternoon. Use whole wheat or white bread. Sourdough does not absorb egg mixture sufficiently. CALORIES: 2 slices french toast, 220 calories. To reduce 30 calories substitute 1 egg and 2 egg whites for the 3 eggs and use fat free milk in recipe. Mix ingredients (except bread) in bowl thoroughly. Pour in shallow dish. Heat griddle or skillet to medium heat (375F). Grease with vegetable oil if necessary. Dip bread in egg mixture to cover both sides. Place on griddle and cook about 4 minutes on each side until golden brown and egg mixture is cooked through. TO COOK IN OVEN: Place dipped bread on generously buttered baking pan (15 X 9), drizzle any remaining egg mixture over bread. Cook in 500F oven for 5-8 minutes until bottoms are golden brown, turn and cook another 2-4 minutes. TOP WITH: Sprinkled sugar (powdered or granulated), maple syrup, pancake syrup, jam, marmalade, fresh fruit compote or warm fruit (recipe below). Put all in saucepan and simmer for 5-7 minutes until fruit becomes syrupy. Serve warm. Return to HOME PAGE -- Healthy Diet Plan.